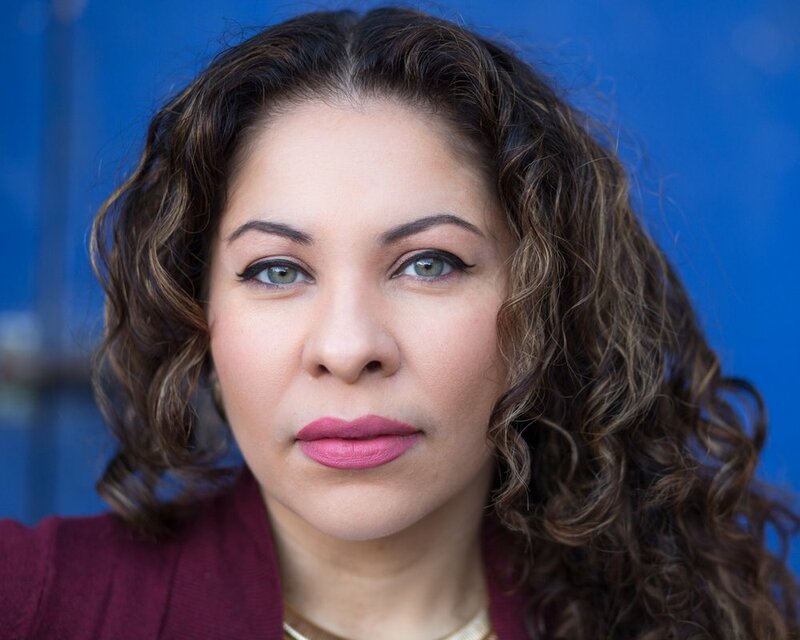 Michelle Angela Ortiz engages the experiences of immigrants in Philadelphia, especially through family stories and intergenerational histories. Seguimos Caminando (We Keep Walking) offers what she terms a “moving monument” to mothers unjustly detained at the Berks Detention Center, a prison outside Philadelphia for immigrant families. 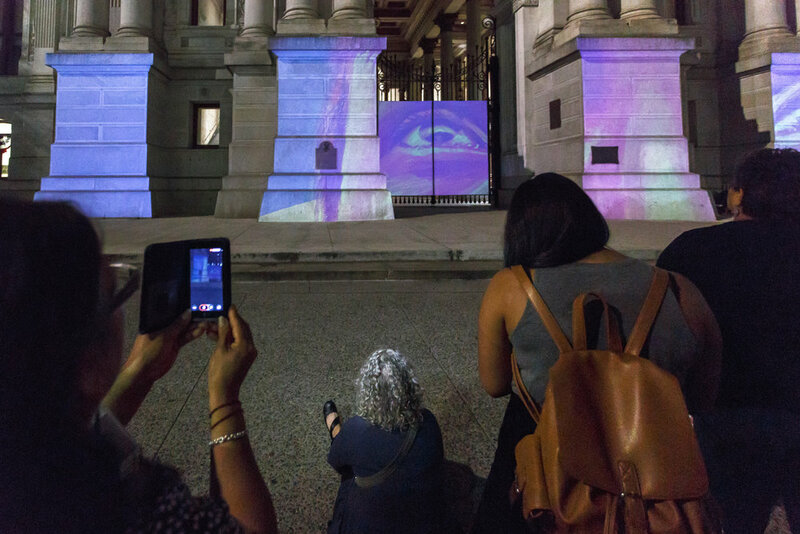 Ortiz reimagined City Hall’s north gates and facade as a space to project these women’s narratives, rendering them through animated images based on writings by and interviews with two mothers who shared their stories while they were detained. The projections were shown on Wednesday and Friday evenings during the run of the exhibition, with accompanying narration broadcast through speakers on the City Hall apron. 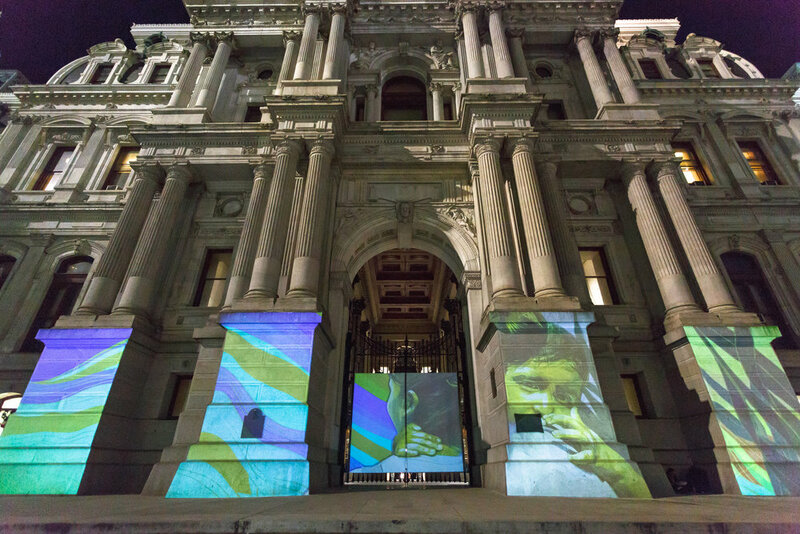 On a building decorated with hundreds of sculptures marking the city’s historic and mythic past, from Indigenous figures to European colonists, Ortiz’s monumental projection highlighted the story of mothers who arrived in Philadelphia in a contemporary moment. Ortiz’s work addressed aggressive immigration policy and attempts to affirm Philadelphia’s status as a sanctuary city. The artist produced Seguimos Caminando with the Shut Down Berks Coalition and the mothers detained at the center. 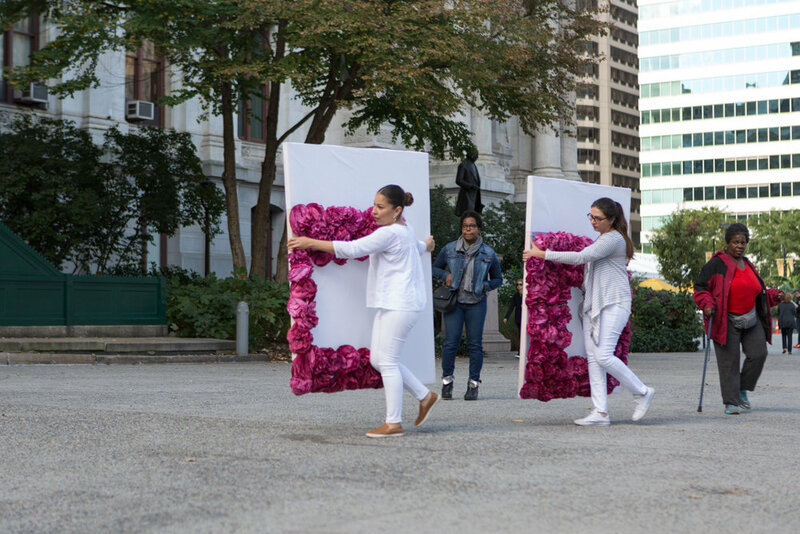 Together, they organized a creative action, titled Flores de Libertad (Flowers of Freedom), which involved making of hundreds of paper flowers in open workshops, classrooms, and at the detention center. 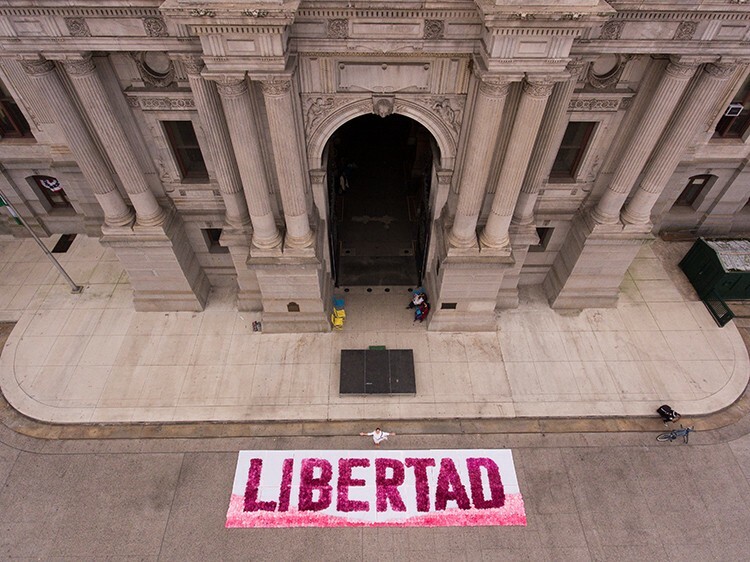 The flowers, which included messages from and to the mothers, were assembled at City Hall to spell out the word LIBERTAD and draw attention to the movement to shut down the center. An installation of Flores de Libertad (Flowers of Freedom) was in view at the Kennedy Center during the Arts Summit at The Kennedy Center in Washington, D.C. on April 16-23, 2018. Partners: The City of Philadelphia; The Office of Arts, Culture and the Creative Economy; and the Department of Public Property. 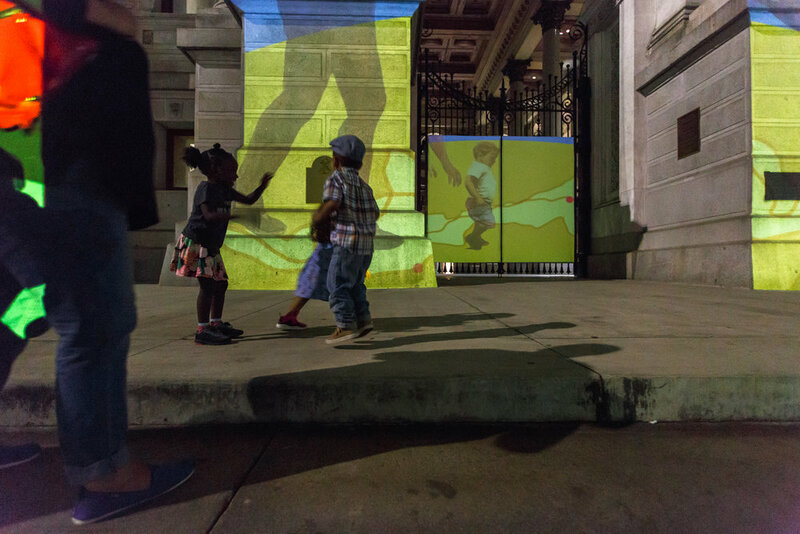 Seguimos Caminando (We Keep Walking) was presented as a part of the Monument Lab: Philadelphia (2017) exhibition. My moving monument is a tribute to the undocumented mothers detained at Berks Detention Center, a prison outside of Philadelphia for immigrant families. The work will be an animation informed by the collective stories centered on the mothers’ journey, resilience, and fight for freedom. Their animated stories will be projected on the gates of City Hall in Philadelphia. In addition to the animation, the mothers inside will produce paper flowers that will join the flowers created by participants through creative workshops that I will lead at the Barnes Foundation’s Monument Lab Research Field Office. The flowers will be placed in front of the animated piece and will highlight the messages of the mothers detained. Michelle Angela Ortiz is a visual artist/skilled muralist/community arts educator who uses her art as a vehicle to represent people and communities whose histories are often lost or co-opted. Through painting, printmaking, and community arts practices, she creates a safe space for dialogue around some of the most profound issues communities and individuals may face. Her work tells stories using richly crafted and emotive imagery to claim and transform “blighted” spaces into a visual affirmation that reveals the strength and spirit of the community. For over fifteen years, Ortiz has continued to be an active educator in using the arts as a tool for communication to bridge communities. As a highly skilled muralist, Ortiz has designed and created over 50 large-scale public works nationally (PA, NJ, MS, NY) and internationally. Since 2008, Ortiz has led community building and art for social change public art projects both independently in Costa Rica and Ecuador and through the United States Embassy as a Cultural Envoy in Fiji, Mexico, Argentina, Spain, Venezuela, and Honduras. In Cuba, she completed the first US-funded public art project since the re-opening of the United States Embassy in Havana in 2015.